This story was updated at 11:50 p.m. ET. Three Chinese astronauts returned to Earth Thursday (June 28) after 13 days in space on a historic mission that made their country only the third nation ever to successfully dock a manned spacecraft to another in orbit. 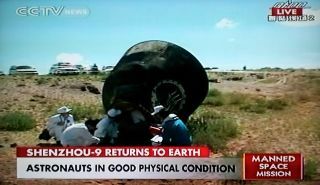 China's Shenzhou 9 space capsule landed at about10 p.m. EDT (10 a.m. Friday, June 29 Beijing time) in Inner Mongolia, an autonomous region of the People's Republic of China. To prepare for their journey home, the space crew — which included China's first female astronaut Liu Yang — separated the Shenzhou 9 capsule its target, the Tiangong 1 prototype space module, on Wednesday (June 27). Their landing was broadcast live on China's state-run CCTV television network, showing the capsule streaking through the atmosphere like a meteor, deploying its main parachute, then making the final landing and rolling over on its side in a rough touchdown. Jing and crewmates Liu Yang and Liu Wang appeared to be in good health after their space mission. The trio wore broad smiles and waved to cameras after leaving their spacecraft, but did sit in reclined chairs to help ease their adaptation back to Earth's gravity after nearly two weeks in weightlessness. Shortly after the landing, China's Premier Wen Jiabao proclaimed the Shenzhou 9 mission a complete success. "This manned docking mission of Tiangong 1 and Shenzhou 9 marks a large milestone, a major breakthrough for China to master the space docking technology," Wen said while reading a statement. "And also, it marks a decisive step forward on China's second step on its space strategy." China's Shenzhou 9 mission, which included successful displays of manual and automatic dockings, represented an important leap forward for China's space program. In addition to being China's longest space mission to date, it also tested technology vital for the country's goal of building space station in orbit by the year 2020. "Chinese astronauts have their own home in space now," Jing told China's President Hu Jintao on Tuesday (June 26) during a special call according to the state-run Xinhua news agency. "We are proud of our country!" And while the orbital linkups are important technological achievements for China, the mission also carried a wider social impact because it included the country's first female astronaut: the 33-year-old Liu Yang. "It was like a home in Tiangong, and I feel very happy and proud of my country," Liu Yang told reporters after landing. Jing, the commander, is China's first veteran astronaut to fly in space twice. The third crewmember, Liu Wang, served as the Shenzhou 9 docking pilot. "It feels really good to feel the ground and to be back home," Liu Wang said. The Shenzhou 9 mission launched into orbit on June 16 and performed China's first manned space rendezvous, after the spacecraft robotically docked to Tiangong 1 on June 18. Several days later, on June 24, the astronauts backed away from the orbiting module and parked their Shenzhou 9 spacecraft once more, demonstrating manual control over the procedure as well. "This work was done by all space pioneers and staff and we'll remember you. It will be written in history," Wen said. The successful linkups made China only the third country, after the United States and Russia, to accomplish manned dockings in orbit. "The data will help us improve technologies for astronauts' future, long-term stays in a space station," said Chen Shanguang, chief commander of the mission's astronaut system, according to Xinhua. China is not a member nation of the $100 billion International Space Station in low-Earth orbit, a roughly 430-ton orbiting outpost that is jointly operated by more than a dozen countries. But Chinese officials have outlined an ambitious space program for the nation, which includes collecting samples from the moon and robotically returning them to Earth before landing astronauts on the lunar surface. The Shenzhou 9 mission is China's fourth manned spaceflight. Previous expeditions were launched in 2003, 2005 and 2008. The Tiangong 1 test module was launched into orbit in September 2011. In November, a robotic spacecraft, called Shenzhou 8, completed the country's first unmanned space docking. According to Chinese officials, Tiangong 1 has performed well, and could play host to another crew in the near future. "Based on current conditions, the service of Tiangong 1 can be extended," said He Yu, chief commander of the Shenzhou 9 spacecraft, reported Xinhua. "It has consumed less than one-fourth of its fuel and no back-up systems have been used." Depending on its condition, the module could remain in orbit as China continues its space station construction efforts. "If Tiangong 1 was in perfect shape, it could work side by side with Tiangong 2, which will be launched in the future," He said.